If it ain’t broke, don’t fix it. 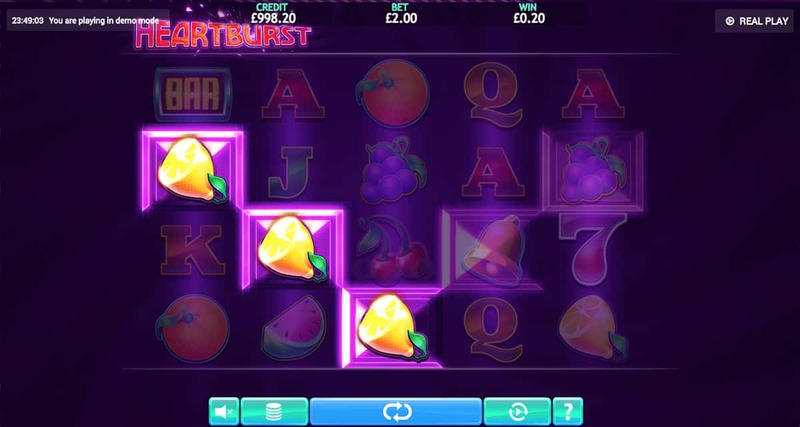 That seems to be going through the minds of lots of gaming developers recently as the trend of nostalgic, retro slots with heavy fruit influences seems to continue. 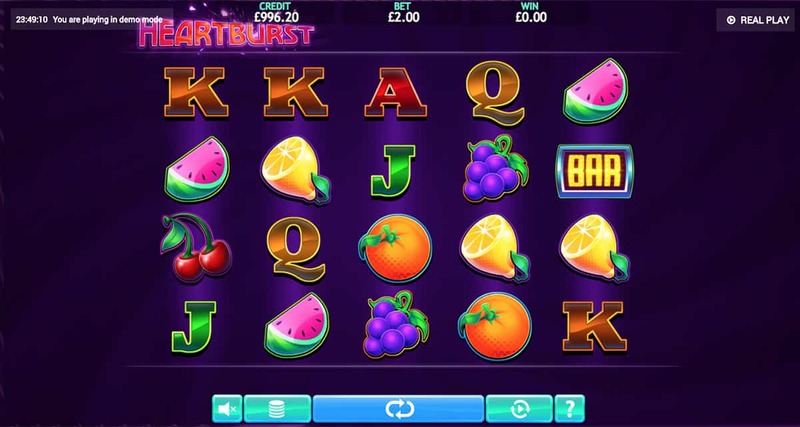 Eyecon Games is no different as its Heartburst slot is a love song to the slots of old and now, thanks to this Heartburst Jackpot Slot version, we also have the alluring prize of Mini, Maxi and Mega Jackpots to tantalise us as we spin these reels. 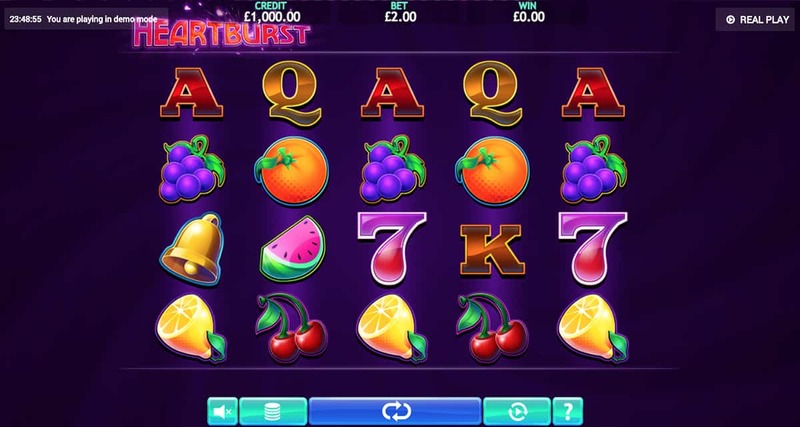 Old slots may remind us of fruit machine classics, but that doesn’t mean the background has to be the grimy side of a run down pub. Not with Heartburst, that’s for sure. It’s more like a wine bar with its dark violet background, exuding class and sophistication. This continues on to the slot’s symbols, each having been deftly designed to stand out on its position on the reels. With a hark back to the slots of old, many of the game symbols are familiar. We’re talking Lucky Number Sevens, Bars, Bells and fruits such as Cherries, Grapes, Oranges and Watermelons, not to forget the lower paying card values. And of course…the Heart! 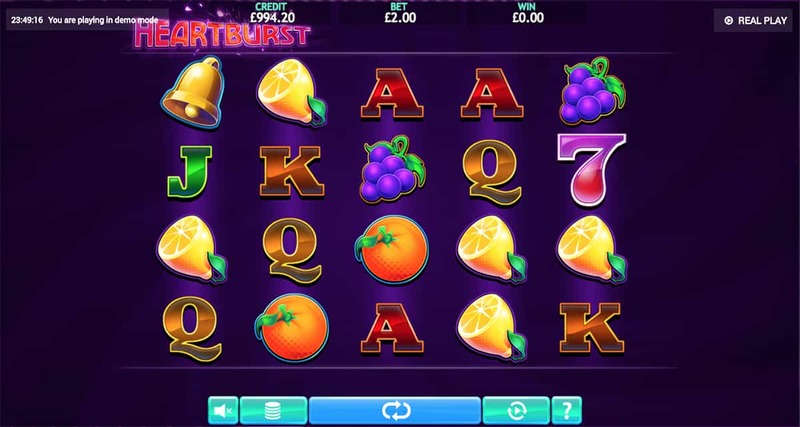 This bright bundle of love is the Heartburst Jackpot slot’s Wild and only appears on the first, third and fifth reel. When it does, the screen lights up with bubbling hearts - as does our bank balance thanks to the it x3 Multiplier it brings to any win. Onscreen, Heartburst almost appears ethereal due to the contrasting colours on screen, combined with the smooth spinning action. When we do land a winning combination, there are no crazy lines that ping up to highlight the winning payline. Instead, the winning payline has almost translucent boxes along them, really giving each symbol its credit in forming that win. When the Heart is in play, not only does it help to form winning combinations but it multiplies each of our wins by three, which is a nice extra enhancement to the traditional Wild. To keep things familiar for everyone who enjoys retro slots, the Lucky Number Seven is our Scatter. When it lands three, four or five times anywhere on the reels, it triggers the Free Spins round. We receive either 15, 20 or 25 spins respectively. Landing more Scatter symbols will add more spins and this can be done up to 15 times, with the potential to win up to 375 Free spins. Eyecon Games carries on the trend of bringing retro gaming back to the mainstream with Heartburst. It’s a subtle slot that really does no wrong. It’s got the slot symbols we know and love, it’s got an awesome Wild with an added extra and we can look forward to Free Spins. There’s nothing fancy about it. And it doesn’t need to be – it’s a quirky visit to slots past and a journey we’d recommend taking.